When you put a URL to tweet, it may just show to URL but nothing else. This is likely to happen when you copy and paste to tweet URL from your Goggle blogger site that you want to promote in Twitter. Thus, you wonder, why the image from my blogger does not show in Twitter post? In fact, many questions had been asked regarding displaying images in Twitter, - how to show image and summary automatically when tweeting a URL? how to display an image in Twitter post from a website page? 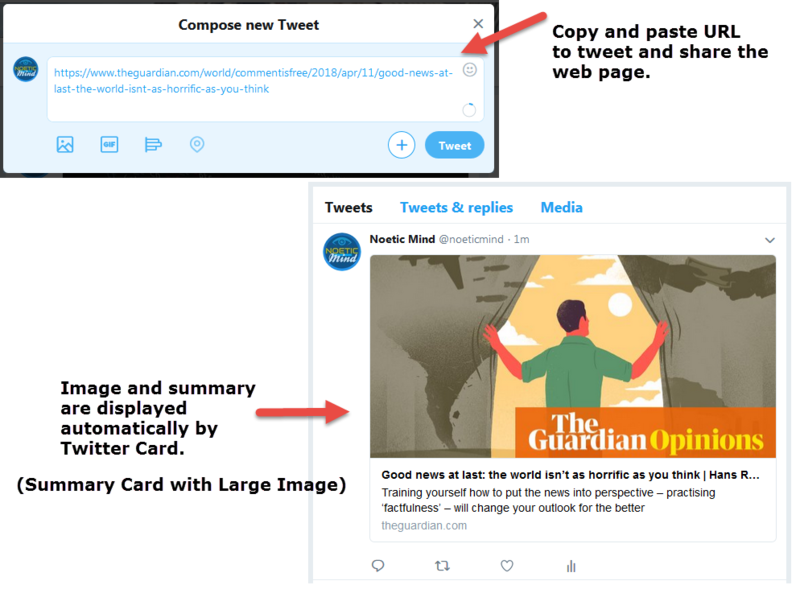 how to include the image automatically when tweeting an article? All the questions pertains to the Twitter Card. The image along with the text summary below the image is the so-called "Twitter Card" that built by the internal Twitter rendering engine. 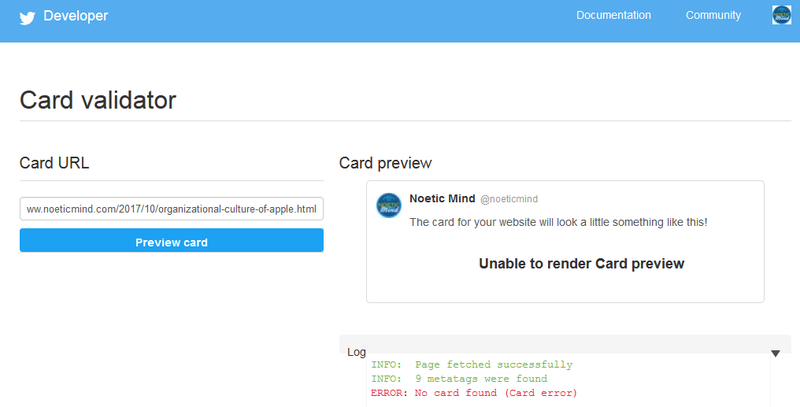 Some special codes must exist in the <head> section of your web page in order to allow Twitter to automatically create the Card when you tweet a URL. The above codes help Twitter to generate the image and summary (Twitter Card) on your Twitter post. Among them, only twitter:card and twitter:title are required; others are optional. If the Twitter card does not exist or is invalid, the error message shows such as "Unable to render Card preview" and "ERROR: No card found (Card error)" as seen in the screenshot above. If you want your web page to show Twitter card automatically in Twitter post when the page URL is tweeted, then you need to add Twitter Card code to your website. Click "Save theme" button to save the code change, and check page validation again. When the Summary Card is specified, the image is shown as a small thumbnail on the left side with the title and summary on the right side. 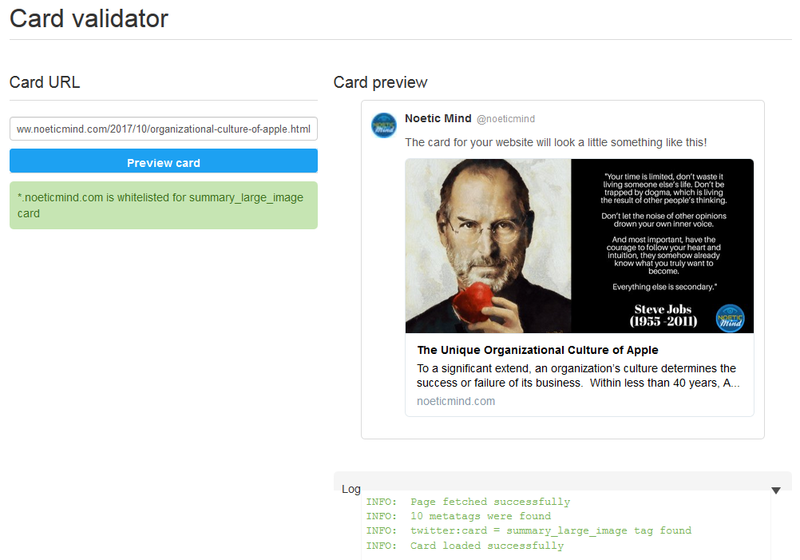 The following Twitter card validation show how a summary card is displayed. The Summary Card with Large Image is the mostly used Twitter Card. More Twitter card properties are often used to control the context and presence of Twitter Card display. Check the source of websites such as medium.com, inc.com, wired.com, and more, you will see they use more than one Twitter Card codes. Note the the org: and expr: are needed to make the variables rendered. However, the one line twitter:card can just make Twitter Card work for Blogger. 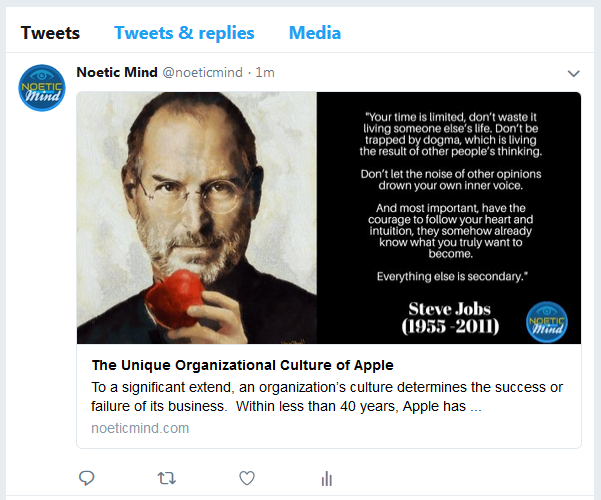 Once the twitter:card is added to the Blogger theme HTML customization, you can share a blog page URL on Twitter to have the image and summary displayed automatically on Twitter post. Twitter Card should work indifferently by tweeting the URL directly or using tools such as SocialBee, Planable, and PromoRepublic. When you use one of the tools, the image and summary are usually shown within the tool interface whether or not the Twitter Card is set on the web page. However, when you post it from the tool, the actual image will only shown on Twitter post if the Twitter Card is set. Also, some tools may mess up between the Summary Card and Summary Card with Large Image. For example, web pages of New York Times are set as Summary Card with Large Image. The view source shows it has the "<meta name="twitter:card" value="summary_large_image" />" code, and the Twitter Card validation confirms that the summary_large_image is found. 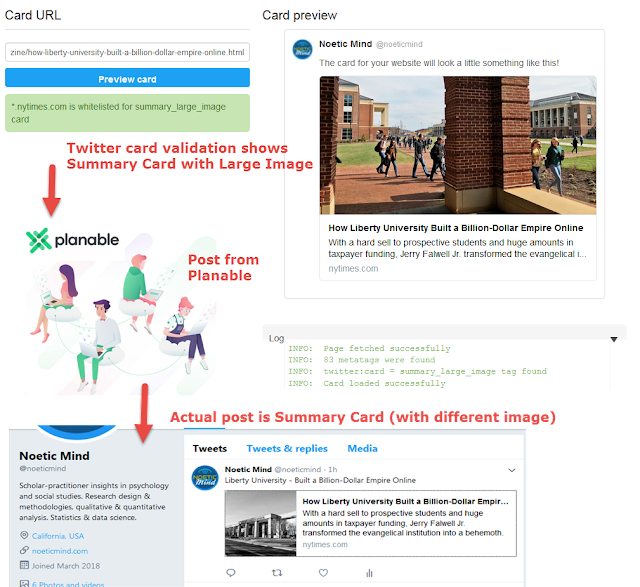 But when the URL of the page is tweeted from Planable, the actual Twitter post shows the Summary Card, and the image is also different from the one shown in Twitter Card Validator. I know this issue is caused by the tool, Planable, because when I delete the tweet posted from Planable and tweet the URL directly from Twitter, the post just shows the Summary Card with Large Image.